Our cookbook sales are a large part of our fund-raising efforts, raising money for our community projects. You'll find our cookbooks to have practical and delicious recipes. They make great gifts for graduates, newlyweds or just about anyone - including yourself! On Statehood day in 1982, the 1st edition of JWL's highly successful Stir Ups cookbook made its debut. By the end of the year, the Junior Welfare League had over 200 retail accounts around the globe. Stir Ups, from America's heartland, salutes the unique flavor of today's Home on the Range. The Great Plains Region with its vast blue skies and golden fields of grain offers its own unique flavor to America's cooking heritage. 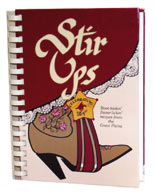 Stir Ups features over 700 boot-kickin' recipes, with chapters including "Shindig Starters," "Dough-si-Dough," "Slim-Pickins," and "Pony Express-ohs." Whether stirring up a gourmet treat for a fancy shindig or simply making play dough... Stir Ups will bring a unique flavor to your Home on the "Range." 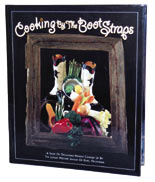 In 2002, JWL introduced their second cookbook, Cooking by the Boot Straps, the official cookbook of Enid. This hardbound cookbook is a must-have piece of Oklahoma heaven, with full-color photographs and a sleek contemporary design. The cookbook includes historical features and profiles of local chefs, plus "Beyond Salt & Pepper," an internationally inspired spice chart, beautiful four-color photography and over 250 recipes from Cowboy Soup to Veal Marsala, Two-Step Tenerloin to Chocolate Spice Truffles and many, many more! Get both cookbooks for one low price!